This original Spanish home at 1903 Prosser Ave., LA CA 90025 received a price reduction this week of 10% or $100,000, down to $899,000. 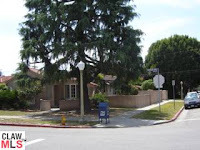 This corner lot property just south of Santa Monica Blvd. has been on the market for 276 days now. According to the MLS, the home is a 3 bedroom / 1 bath, 1,240 sq ft home on a 7,425 sq ft lot. The home is mostly in its original condition and is ready for your remodeling, expansion or rebuild.